I am here with the first challenge this year at Time Out Challenges. These snow flakes are die cut from sparkle white foam and grounded with score lines. Both the snowflakes and the sentiment are from our fabulous sponsors Uniko. If you twist with us there is a random selected prize from Uniko...so twist away! Our Guest Designer for this challenge is Claire. She is so very creative. Check out her blog Life on The Scrap Heap, it is full of inspiring cards and I guarantee you will come back ready to craft away! Check out what our design team have created here then I hope you will join in the fun with us. Love those score lines, I always forget to use them although they look SO fab! 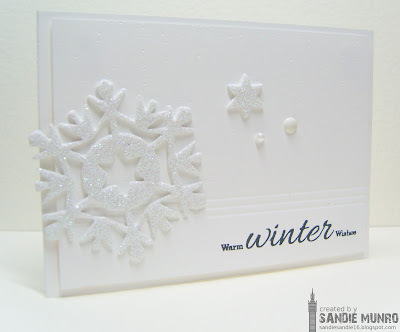 I love the snowflakes too, this card has a lot of dimension and interest although it's so CAS! Great job! Absolutely love this white-on-white card with the touch of glitter and those score lines! It's been ages since I made a white on white card, and I'm not ready to stop making Christmas cards yet, so I think I'll have a go at this one. Your card is very elegant and love the effect of the scored lines. So beautiful and elegant, love all that gorgeous white! So pretty Sandie and how great you can link up with Casology as well. I should do the same! Thanks for having me to guest again...always love to join in! This is perfection, Sandie, that's all I can say - perfection!!! This is so beautiful. The glittery white showflakes look so icy. 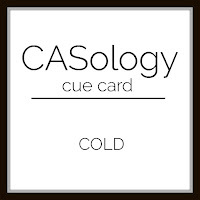 Happy New Year and thanks so much for playing along at CASology this week. Love the glitter & dimension of your snowflake! Thanks so much for playing along with us at CASology this week, Sandie! Beautiful. Love the touch of scoring and the fabulous glitter on the snowflakes! The perfect snowflake!Sandy your card is beautiful! Ahh... I always love white on white. Lovely work on this. I especially like your subtle scored lines. It makes me want to pull out my score board!